This weather resistant motorcycle ATV, UTB USB Power Port (1 amp max.) 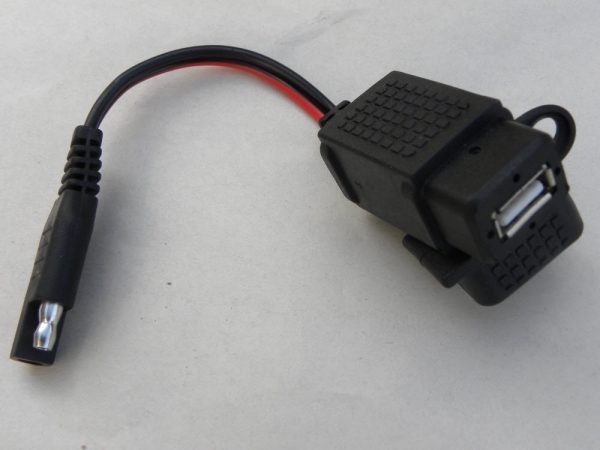 This USB Power port is a convenient way to add a temporary a USB power port on your Motorcycle or any other Vehicle with that has an SAE connection to your battery commonly used for battery tender connection. ** Simple Do it Yourself installation. Plug it in when you need it, unplug it when you are done and take it with you. Note, the USB power adapter is rated for 5vdc 1amp max . With a length over 7 inches long , no need to splice additional wire. Simply plug it in to your SAE connector ( SAE Battery connector not included) and you are set. We also have a 5vdc 2 amps (10watts) version available.